Review is an integral part of the medical writing process and relies on clear communication between the medical writer and the reviewer(s). This is a two-way street. Review can be a frustrating process for both the writer and the reviewer(s) when there is miscommunication. Thus, both parties are responsible for ensuring that the review process runs as smoothly and efficiently as possible. Ultimately, there is no “us” and “them” in the document development process, but a common goal to be reached by a team within a clearly defined timeframe: finalising fit-for-purpose documents for submission to health authorities, which will ideally result in a successful marketing authorisation approval. My aim in this article is to give us writers hands-on tools for improving the communication with our reviewers, by making our review expectations more clear. I am presenting specific, simple principles that reviewers can practice throughout the document review process until they become habitual, including examples of how to provide comments that are unambiguous, actionable, and relevant. Review is a process conducted at different stages of document development, to ensure that a document meets its purpose, i.e., that it is complete, coherent, and aligned both with the overall strategy of a specific project and the expectations of the intended ultimate audience, which for regulatory documents – is always the health authority (not the manager of a certain reviewer!). Review differs from quality control (QC) in many aspects. Review should not be a check of numbers, spelling, and company-specific Style Guide conventions. Ensuring that these aspects are met falls under the responsibility of the medical writer throughout all document development stages, and of QC specialists and document managers/document administrators at later stages; such responsibilities are usually defined by a company’s standard operating procedures (SOPs). While it is often easier for reviewers to check abbreviation lists, fix spelling errors, and propose taste-driven linguistic changes on already linguistically correct text,1 what we ultimately want as medical writers from our reviewers is something else: constructive, unambiguous, and timely strategic input (“strategic review”), primarily on document sections relevant for each reviewer’s functional role (“function-driven review”) and on each document, considering both the document type (“eCTD placement-driven review”, based on its place/purpose within the electronic common technical document [eCTD]) and the document development stage (“staged review”). Several studies have shown that inefficient reviews are not uncommon across the pharmaceutical industry. Throughout several review rounds, the reviewers were asked to categorise their own comments on a specific document into one of the following categories: rhetorical (content-related/strategic), editorial, and stylistic; they assessed their comments as largely rhetorical. When the consultants looked at the drafts and categorised comments based on more objective criteria than personal opinion, they found that the vast majority were in fact editorial and stylistic, even on advanced drafts of the document.2,3 The question is: why? Various reasons account for the often ineffective and inefficient review process seen across the industry, most of which are largely unintentional and can be at least partially corrected with appropriate training. We should not forget that reviewers aren’t primarily reviewers; they have been trained to be experts in their field (for example, statistics, bioanalytics, or clinical research), not communicators. While exercising their role in a pharmaceutical company, they wear many hats, and the “reviewer” hat is just one of them. Often they could even be quite frustrated that the medical writer and other reviewers do not understand what they want. After all, their comment was quite clear! Some reviewers do not have a clear understanding of how their review needs to change based on document type or document development stage, especially in companies that do not provide sufficient training on the eCTD structure during the initial onboarding phase. 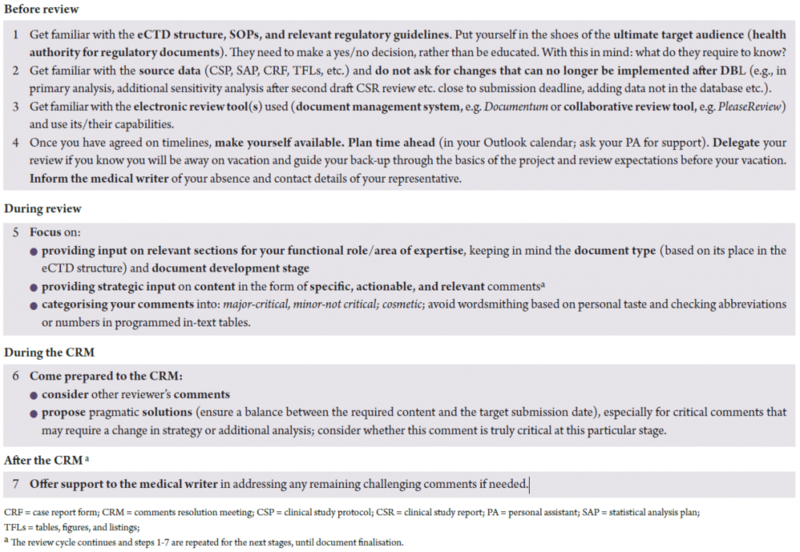 A reviewer will often approach a document with the same “strategy”, regardless of whether this document is, for example, a clinical study report (CSR), a summary of clinical safety (SCS), or a clinical overview (CO), reading it page by page, largely focusing on things like abbreviations and spelling, and gradually reducing the number of his/her comments by the time he/she gets to the results and conclusions sections. I have worked in different pharmaceutical companies and also on the vendor side. Therefore, I’m very aware that the medical writer’s role is defined differently in different institutions, and I’d advise you to always raise awareness about the role played by medical writers in developing documents and in the industry in general, and to clarify the responsibilities of all parties involved, even if these are already covered by an SOP. For us medical writers it may be obvious that in addition to writing, we not only manage comments but also act as mediators in case of conflicting strategic timelines, bringing discussions back on track during meetings and making sure that comments are kept. In line with this, we do not bring all comments provided on a draft to a comments resolution meeting (CRM), but only critical and at times conflicting comments from different reviewers. Keep in mind that some reviewers may have either worked with medical writers in a different set-up in another company (and therefore have very different expectations from us than we assume) or may have never even heard the wording “medical writer” before, especially if they are new in their role in the pharmaceutical industry. If a reviewer is, for example, working on a submission for the first time (even if he or she does not wish to openly acknowledge this), an experienced medical writer can also be a resource for regulatory guidance, eCTD structure basics, and roles of different team members during document development, beyond what is already covered in sometimes multiple and lengthy SOPs. A kick-off meeting for every writing project is a good starting point to set such things straight. The aspects and tools that I provide below (and in particular the tabular presentations) could be introduced at the kick-off meeting with each clinical team you work with, but it is also a good idea to incorporate them in routine cross functional trainings, to be held both during the onboarding phase and as refresher trainings, at least once a year within a given organisation. In addition, laminated hand-outs with key principles and specific examples are always useful at the end of such trainings. The reviewers can keep them on their desk and use them on a daily basis while conducting reviews. Last but not least, when we mentor junior medical writers and review their documents, we should of course also adhere to the same principles. It is up to each and all of us medical writers to create, enforce, and maintain good writing and review practices across the industry. Consider introducing reviewers within your organisation or at the client’s site to a tool that I like to call “The Responsible Reviewer’s Check list” (Table 1). In addition to including it in trainings, I would also suggest attaching it as a pdf when initiating review cycles, and whenever you send a document for review to senior management, either directly or through someone else (e.g. medical/clinical expert, regulatory affairs manager, or the senior manager’s personal assistant [PA]). Senior managers are unlikely to attend your trainings, but will at least be informed of your expectations, and you might end up being positively surprised with the results of this exercise. Also talk to their PA well in advance to set aside time in their calendar. Overall, this tool can be an effective way to create a common understanding within a document development team of what the review process entails. The need for a focused review may seem obvious, but I have nonetheless very often seen statisticians “improving” document wording based on personal taste (and thereby at times changing the meaning of a sentence that was once correct…), clinical experts checking the list of abbreviations rather than focusing on the clinical interpretation of data, regulatory affairs managers adding two spaces instead of one after each full stop throughout an entire document (while ignoring company specific style conventions), and the list could go on. I am sure that all of us have had such experiences with different teams and we can all agree that this is not the kind of feedback we wish to receive throughout the review cycles of a document with tight timelines to be met and critical data to be interpreted. It is both ineffective and inefficient. My experience is that teams need to be reminded of what to focus on, based on their function, document type, and document development stage. Last but not least, some reviewers tend to lose track of the ultimate audience of regulatory documents (the health authority! ), and instead anxiously focus on how their line manager will perceive their review. As medical writers, it is part of our job to bring reviewers back on track and remind them of what to focus on (Tables 2–4). Somewhere around the time of the final draft (e.g. after second draft review), the QC step will take place. Inform your reviewers, as applicable at each draft stage, that the document has/has not yet been QC-ed. The second or final draft is usually also reviewed by Senior Management and/or the Principal/Coordinating Investigator. Other reviewers, such as Key Opinion Leaders, may also be involved at this stage. At CRMs, reviewers belonging to the core clinical team need to be ready to tackle any challenging, strategic, conflicting comments coming from these additional reviewers. Medical writers should remind core team members of that, and potentially also ask them to align with their functional line managers early on, to avoid very late surprises (to the extent realistically possible). Providing good comments takes substantial time during review, but will avoid a lot of confusion within the team later. Learning how to provide good comments also takes time, but once this has been learnt and applied, it pays off for everyone involved in the development of a document. The reviewer is required to take one step forward and not only identify a problem (by simply criticising: “This is bad”), but also provide a solution. This requires both some thinking and often even digging into the data, however this is the only way in which a review is actually “complete”, although a reviewer e-mailing you saying “I have completed my review” may have thought otherwise. Without a proper and truly complete review, the review process does not add much value, it uses time and resources, and makes us medical writers feel like we are pulling teeth at CRMs. 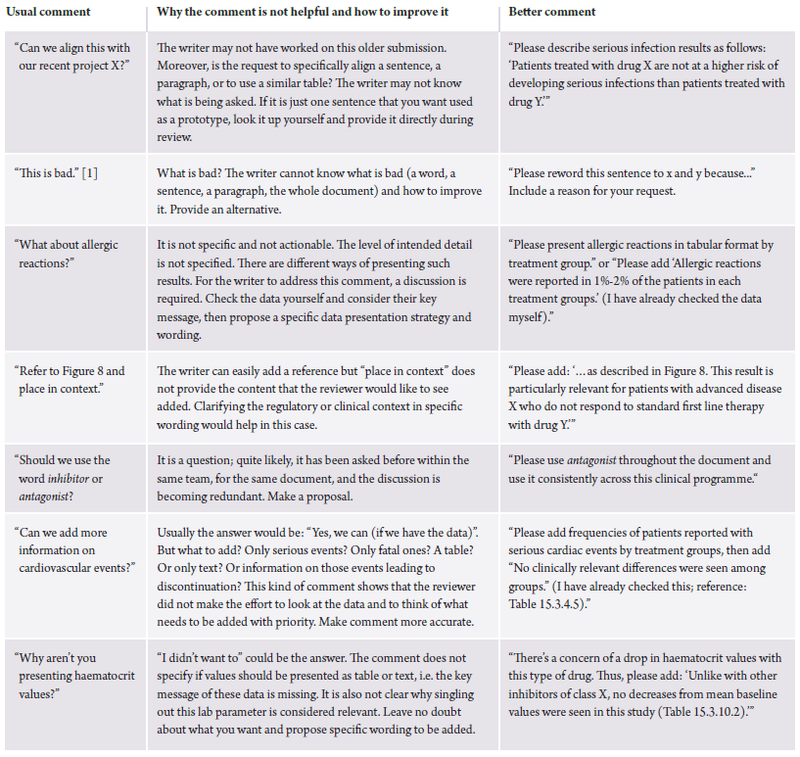 Replacing broad questions with specific answers and clear rewording suggestions pays off, but we need to train our reviewers and put them in the shoes of those receiving poor comments, clearly showing them why their comments aren’t as clear as they may think (Table 5). Specific and constructive: “This is bad” written on the front page of a document does not indicate what is bad and does not help the team move forward and improve the document; pointing out specifics of what is bad and suggestions on how to “correct” the bad part does. Actionable: using an action verb (“Add/write/refer to x, y, z”), not an open question (“What about adverse events?” or “Why didn’t you describe adverse events?”, to which the writer may think “Aha, yes, What about them?” or “Because I didn’t want to.”) is always better. Relevant: reviewers should consider the timing and relevance of their comment before asking for a major change that would either completely change the structure or is too late (keeping the target submission timeline in mind) to address (e.g., we cannot redefine the primary analysis of a study post-hoc [after data base lock]); there is a difference between a “nice to have” comment and a “critical” one [a must for the team to consider and discuss]). It is essential that we are clear about what we want and how we want it done. We medical writers should clarify what we want the reviewers to focus on and how comments should be provided, ideally well ahead of the start of the review process, i.e. at the kick-off meeting. If reviewers understand what is being asked of them, those of us wearing the medical-writing hats will hopefully receive comments that are easy to implement and do not require endless discussion at CRMs. Nobody is born a reviewer. Review is a skill that can be taught and learnt. As professional medical writers and communication experts, we should take the time to train our teams both on our and on their responsibilities when it comes to document development, not all of which can be covered by an SOP. In particular, we should train them on how to provide clear, specific, constructive, actionable, and relevant comments, thereby helping each team member meet his/her full “reviewer potential”. Everyone involved in the development of a document will benefit from this, which will not only ensure a smooth collaboration, but ultimately will save the pharmaceutical company as a whole both time and money. Having the reviewers adhere to basic, clearly laid out principles when they conduct their review, aligned with their functional role, document type, and review stage, should improve the efficiency and effectiveness of the review process throughout clinical development and across organisations. I would like to thank Lisa Chamberlain James for reading an earlier version of this article and for her valuable feedback. Fiebig D. Back to the future…or the amazing lack of progress in effective document review. Med Writ. 2015;24(3):169–72. Bernhardt SA. Improving Document Review Practices in Pharmaceutical Companies. J Bus Tech Commun.2003;17(4):439–43. Cuppan GP and Bernhardt SA. Missed Opportunities in the Review and Revision of Clinical Study Reports. J Bus Tech Commun. 2012;26(2):131–70. ICH E3 Guideline: Structure and Content of Clinical Study Reports http://www.ich.org/products/guidelines/efficacy/efficacy-single/article/structureand-content-of-clinical-study-reports.html. CORE Reference: Clarity and Openness in Reporting (E3-based): https://www.corereference.org/media/1032/core-referencev1_0.pdf.